GYMNOVA was the official supplier for this competition that brought together more than 38 nations. 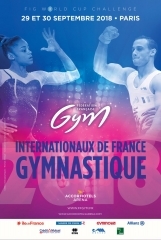 Paris was hosting the new French Gymnastics Internationals, a major World Cup event, from 29 to 30 September 2018. Taking place at the Accor Hotels Arena in Paris, it was the opportunity to experience an incredible show from the world’s best gymnasts in Women’s and Men’s Artistic Gymnastics.